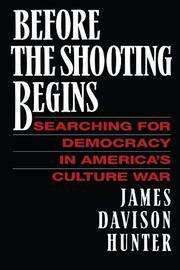  Noting that cultural wars tend to precede the shooting kind, sociologist Davison (Univ. of Virginia; Culture Wars, 1991, etc.) opens here with some pretty hair-raising prognostications: the last time America was rent by such bitterly acrimonious debate over fundamental issues of political ideology was just prior to the Civil War. Essentially, this is an overview of the abortion question, for the author takes it as axiomatic that all questions in contemporary ideology are ultimately about the body, which itself stands as a metaphor and reflection of the ``body politic.'' This interesting point of departure, though, doesn't lead Hunter to a very convincing scenario when he suggests that the gunning down of abortion provider Dr. David Gunn in Florida in February 1993 was the first shot in a real, not discursive, war. The author, however, is more effective at showing how public debate has become reduced to a level of antidemocratic and intolerant caricature and slander. Bias in the press goes largely unpunished and unexamined, he claims, and it is indeed curious to learn that the number of anti- abortionists arrested (over 65,000) between 1987 and 1991 is higher than the number of those arrested from any other organized protest movement this century. Hunter is not rushing to the defense of pro- lifers here, but he is merely pointing to the trivialization of the abortion issue in the media and the consequent veering away from true democracy that such a skewing entails. Although he exaggerates the significance of the abortion issue with regard to the continued existence of an American cultural unity, Hunter does make shrewd and intriguing points about the media and their ever-accelerating moronism--though hardly ones we have not heard before.